Pork ribs are a treat any time of the year. With a little inside information and attention you can prepare excellent pork ribs every time. 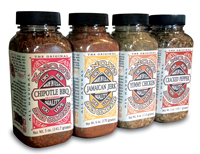 Although dry rubs are supposed to be 'dry rubbed' they can also make excellent marinades. Below are basic recipes for pork ribs using dry rubs as marinades as well as dry. Mix together 2 or more heaping Tablespoons Knox's dry rub with orange juice. Marinate the pork ribs for at least an hour in the dry rub mixture. Arrange ribs, in a single layer, in a baking pan. Pour the dry rub marinade over them. Cover pan with foil and cook for approximately 3 hours, depending on thickness. To brown the ribs a little, remove foil, turn oven to 400, and cook ribs uncovered for the last 10 to 15 minutes. When done remove and let stand 8 to 10 minutes before serving. If you can't wait go ahead and serve. They should be so tender that they will fall right off the bone. Sprinkle liberal amounts of dry rub over your ribs. Massage evenly into surface and refrigerate for 1-4 hours. For your basting sauce, mix together and bring to a boil 2 or so Tablespoons dry rub, water, vinegar, Worcestershire sauce, oil and lemon or lime juice. Prepare the grill for long term low temperature cooking. Temperatures around 220 - 225 degree F. is perfect. Baste ribs with basting sauce while they reach room temperature. Baste one more time and place on the grill. Baste and turn every 30 minute for 5-8 hours until tender. Cooking times vary depending on cut and temperature. See "Cooking Pork Ribs" for more information. Serve with potato salad, corn on the cob, cole slaw and ice cold beer or tea.